Santa is filling his sleigh with VTech toys that will delight and excite young children and parents alike. With the race on to get your Christmas shopping done, we're offering you the chance to win the Cars 3 tablet and Ready to Race Lightning McQueen for your pre-schooler, to help you along. Help Lightning McQueen win the big race with the Cars 3 Race & Learn Tablet™. Interact with your favourite Cars 3 characters as they come to life in fun and engaging activities on the LCD screen. Seven exciting games introduce letters, objects, spelling, number order, counting, logic and more. Find letters to help Lightning McQueen gear up for the race, spell out words on road and crowd signs, count objects as you help clean up Doc Hudson's garage, spell out words to pass other cars in the race and much more! Press the character buttons to meet and interact with Lightning McQueen and his friends. The tablet also introduces beginning typing with a QWERTY keyboard. Get on the fast track to learning with Lightning McQueen! Help Lightning McQueen win the race with Ready to Race Lightning McQueen™. 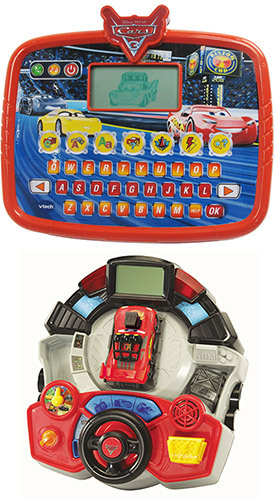 With this interactive racing driver, kids can grab the wheel and explore letters, counting, problem solving, logic and memory while playing 15 games. Meet all your favourite characters while completing fun puzzles. In five different racing games, use problem solving skills to figure out which accessory to attach to Lightning McQueen to boost his speed in the racing games. In Pit Stop Mode, help Cruz Ramirez complete patterns for the simulator, use your memory and concentration to find Jackson Storm, complete words to fix Ms. Fritter's plates, help Junior Moon clean up by counting car parts and complete Lightning McQueen's graphics. Cool animations, sound effects and an interactive driving panel add to the racing fun! Suitable for ages 3-6 years, both items are available from Kmart and selected toy retailers.